If you’ve been putting off entertaining because you just don’t have any fun party ideas, why not choose a spring color for your inspiration? Yellow screams spring time, daffodils and sunny days. 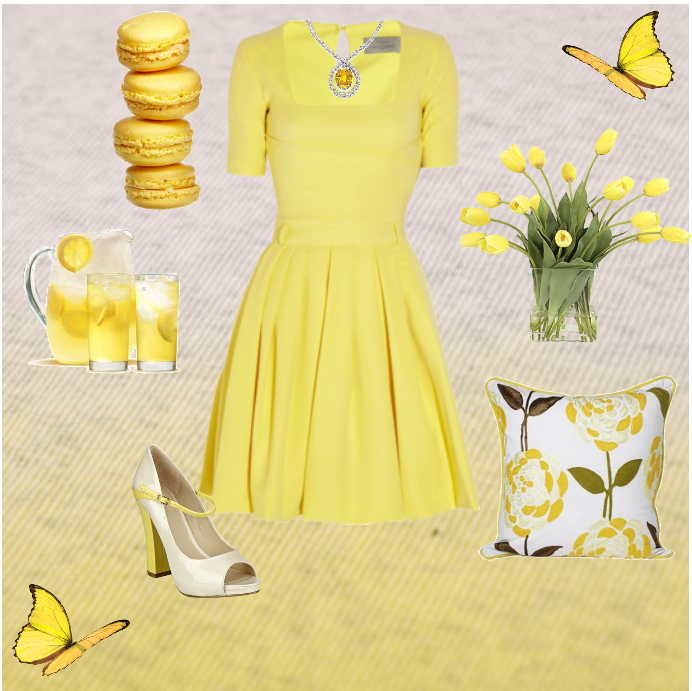 You can easily pull together a Mellow Yellow party theme. Start with yellow card stock for your invitations or choose online invitations with some bright yellow accent like a smiley sun, bright tulips or lemons. Decorations are simple – pile lemons into clear glass bowls, add a couple of yellow throw pillows to your decor. Fill a vase or two with yellow flowers and use a yellow tablecloth for your table. Food choices can include anything yellow like pineapple, bananas, lemon (insert your favorite sweet like cake, cookies, tarts, pudding, pie), cheese, crackers, etc. Drinks can include lemonade and, if you want to really carry out your party theme, bottles of Mello Yello. Of course, the hostess can also be attired in something yellow (unless the hostess is me in which case the hostess would look terribly ill). I loved this dress. It just said Savvy Hostess while the shoes screamed “We’re so cute! You should buy us.” Really, they did. Have fun with your party theme and remember the most important thing is relaxing and having fun with your guests.